This edit was a forgone conclusion. 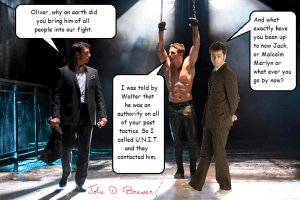 Once I saw this picture of John Barrowman & Stephen Amell from the CW’s Arrow, I knew the Doctor had to be added. Hope you all enjoy it. 10th Doctor Arrow CaptZenos CW David Tennant doctor who John Barrowman second geekhood Stephen Amell U.N.I.T.